Two things I'm loving at this moment: SPRING! It's 80° today and it was in the mid-80s this past weekend. And also, the color blue... preferably cobalt and turquoise! Pattern Sizing: X-Small - X-Large. I cut the large. Description: Pullover top A, tunic B or dress C have wide neckline and unfinished edges; top A front and back extend to draped sleeves, very narrow shoulders and lower band; tunic B, dress C instructions to create woven chain detail are included, tunic B at neckline, dress C along hemline band; dress C has contrast inner hem band. 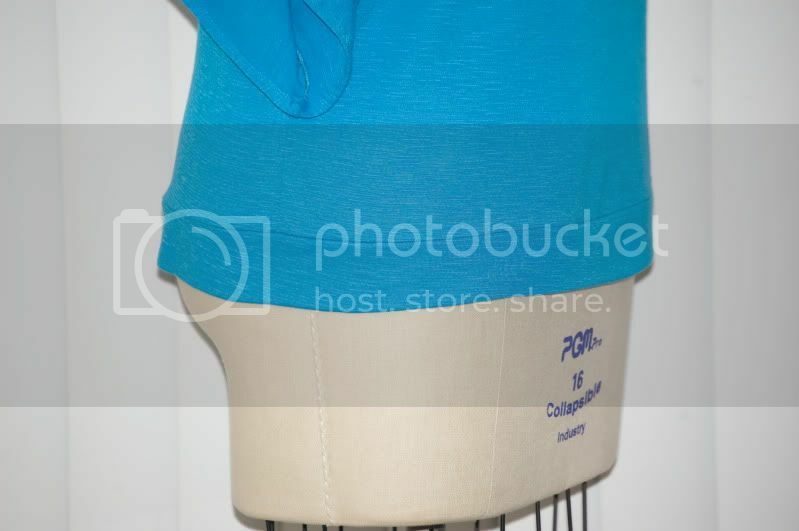 Fabric: A very soft, lightweight turquoise jersey (70% poly/30% rayon) from Hancock Fabrics. Were the instructions easy to follow? Yes! They were so easy that I only glanced over them and did my own thing. What did you particularly like or dislike about the pattern? I like the style. It's very IN right now and perfect for this and upcoming warm/hot weather. I didn't like the raw edge. It looked "unfinished"... like it was waiting to be hemmed. This is my personal preference and had a lot to do with my fabric. Some knits I don't mind having a raw edge, but this is just not one of them. Also, the back and the front only attached at a very narrow point at the shoulder. It was suggested that the seam should be finished with binding tape. Since my fabric is very lightweight, I fused that area with tiny pieces of knit tricot interfacing and trimmed the seam allowance. And since I hemmed what should have been raw, I turned in that part and you can't see the interfacing. Pattern alterations or any design changes you made? Another MAJOR thing that bothered me is that the dolman style sleeve hangs so low that the armscye actually stops almost at the waist! Imagine raising your arm to wave, reach or scratch your head -- NOTHING BUT BRA! So I tacked the sleeve at the front and back hems. That solved that problem. I also added 1" to the length. Would you sew it again? Would you recommend it to others? I have so many tops/shirt patterns that I'll probably never get to this one again. But I do recommend it -- if you like this style. I like this top! Its really pretty! You did a super job. That's a fabulous looking top, and I love the color! Love this! Too bad its out of print now!